A lot of venture money is chasing social commerce startups right now because group buying sites are chasing a lot of money (in the form of consumer spending). Groupon kicked things off with its $135 million mega-round last April. LivingSocial has raised $49 million so far. And now BuyWithMe just closed a $16 million B round led by Bain Capital Ventures, bringing its total raised to $21.5 million. Matrix Partners also invested. “This reminds me a lot what online travel looked like in 2000 with so many players,” CEO Cheryl Rosner tells me. “It is a large opportunity, and the market is organizing.” There are literally dozens of daily deal sites in the U.S. alone, and it is a city-by-city fight for mindshare with consumers and local merchants. Rosner, who was just recruited as CEO in April from TicketsNow (where she was CEO after stints at Expedia and Hotels.com), plans to use the cash to expand to 20 cities by year end from five today—Boston, New York, Philadelphia, San Diego, and Washington, D.C.
New York City-based BuyWithMe offers daily discounts on products and services from local merchants such as pilates classes, massages, and restaurants. The main target market is urban females, but some deals have universal appeal. 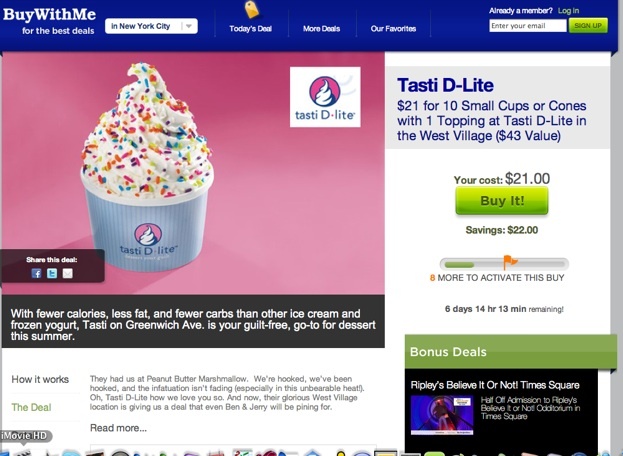 For instance, right now in New York City, which is suffering under a brutal heat wave, the deal is ten small ice cream cones at Tasti D-Lite for $21. As with Groupon, deals only become active once a minimum threshold of consumers agree to purchase the item or service, but each deal lasts for a week (versus the 24-hour time-limit on Groupon). As with any sale, putting a time limit on the deals gives potential buyers a greater sense of urgency. But the real key to the growth of these social commerce sites is the social aspect. Deals are shared through email, Facebook, and Twitter. “Great deals create great viral brushfires,” says Rosner. “If you have the right opportunity and right value people will share it with their friends.” The phenomenon is very different from one-by-one coupons or even more traditional group buying clubs of the past. “The social aspect of the Web over the last couple of years created this great tipping point for value shopping, and for savvy shoppers to be exposed to great deals,” explains Rosner. The average deal price on BuyWithMe is around $30 to 35, which is up from the mid-$20 range just a couple months ago. Even after the discount, which is typically 50 to 70 percent off, the local merchant splits the 35 to 50 percent of the remaining revenue with BuyWithMe. While that doesn’t sound like a great deal for the merchants, most of these deals are for excess, unsold, perishable inventory such as classes, restaurant reservations, or other services. It is really more of a marketing opportunity for local businesses to get exposed to new customers and get people to come into their shops who otherwise wouldn’t think of it. “It is an extremely profitable business model,” notes Rosner. She is plowing all her cash back into the business right now, however. BuyWithMe was founded only a year ago in May, 2009, and already employs 52 people. A BuyWithMe sales rep personally visits each merchant that runs a deal (building a local marketing business, even one online, requires a lot of legwork). But can BuyWithMe hope to compete with Groupon, which is already offering daily deals in 150 cities in 18 countries (75 cities in the U.S.), employs more than 300 people, and has raised a lot more cash? Social commerce may very well turn out to be a winner-take-most market because of the network effects at play. The more active buyers there are in each city, the faster deals spread virally through social networks and sell out faster, thus attracting more merchants and better deals. It is still early days, though, and the potential market is huge. Is there room for 100 daily deal sites? Probably not. But there is room for at least four or five to carve out decent-sized businesses, even if Groupon ends up taking the lion’s share of the market. The land grab is on, and BuyWithMe is in the race.